Welcome to Trip online in Bangkok/City of Thailand IS JUST AROUND THE CORNER !!! Bangkok is the capital city with 10 millions people. Ayutthaya, Chiang Mai, Phuket, Pattaya and Samui are tourists' favorite destinations. It is only one time zone in Thailand. The time is 7 hours ahead of standard time (UTC/GMT). No Daylight saving time observed. For example Thailand is on Monday 8.00 AM when it is Sunday 8.00 PM in New York City, USA. The time in Thailand is 8.00 AM when it is 1.00 AM in London, UK. Thai is the official language. Taxi drivers, students can speak some English. Road signs, Train station signs are in Thai and English. Thai people in general will greet each other by doing the Wậy (putting your two palms together between your chest and lower your head towards them). They will do this when they meet someone for the first time, when they meet a senior person and in most formal situations. The Wậy also has other numbers of functions, such as used by the juniors when saying goodbye, to show respect to sacred images and places. Thailand has six international airports, Bangkok, Phuket, Koh Samui, Chiang Mai, Sukhothai and Hat Yai. Thai Airways and Bangkok Airways connect all these international airports to domestic airports like Krabi, Chiang Rai and many others. 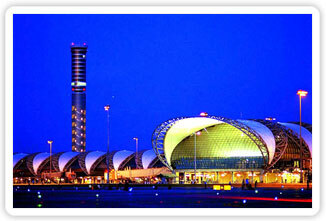 The new airport in Bangkok is called Suvarnabhumi, this new airport is situated 30 KM east of Bangkok towards Pattaya. 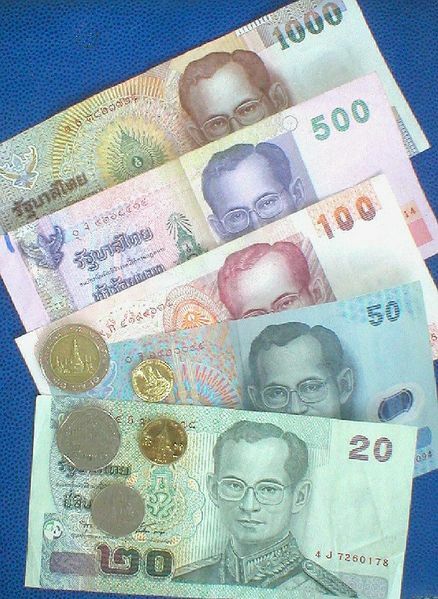 The basic unit of Thai currency is Thai Baht, base on 100 satang in one baht. Coins denominations are 25 satang, 50 satang, 1B, 5B, 10B. Paper currencies come in denominations of 10B (brown), 20B (green), 50B (blue), 100B (red), 500 (purple) and 1000B (beige). Thailand climate is mostly sunny and dry throughout the year except around July to November which experiences a monsoon climate on the southwest part of Thailand. The dry-cool season arrives in November util mid-February and the hottest temperature is from March to June. It rains most during August and September, more and longer in the south which is subject to the northeast monsoon from November to January. Tropical climates, Thailand have 3 seasons: Winter, summer and rainy season. Temperatures are 20-33 Celsius in winter and 26 to 36 Celsius in summer. Prepare light clothes in summer, umbrellas in rainy seasons and light sweater in winter. Please dress in polite clothes and shoes when visiting temple. Tipping is not a normal practice in Thailand; however they are getting used to it in most hotels and restaurants. Most service add 10% charge. Small changes are welcome. Thailand uses 220 Volt, 50 hertz AC. Travelers from US and Japan need automatic voltage adapter for example: 100-250V 50-60 hertz. You also will need a plug adapter which can be bought from local department store. The country code for Thailand is 66.